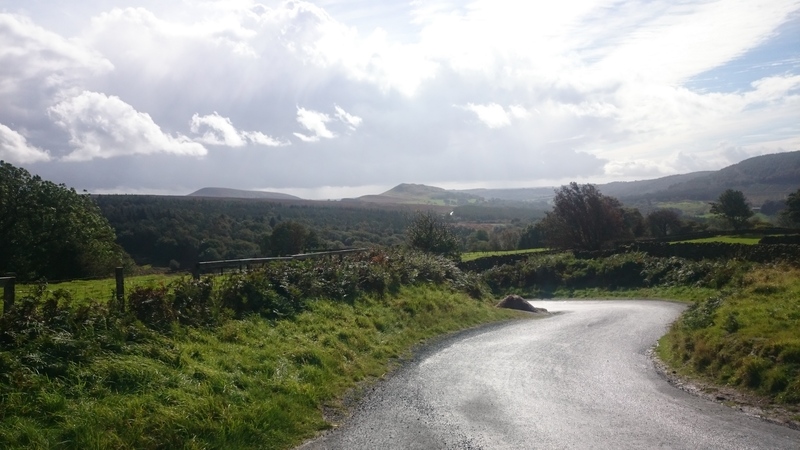 I’m a bit of a fan of the North York Moors for cycling. 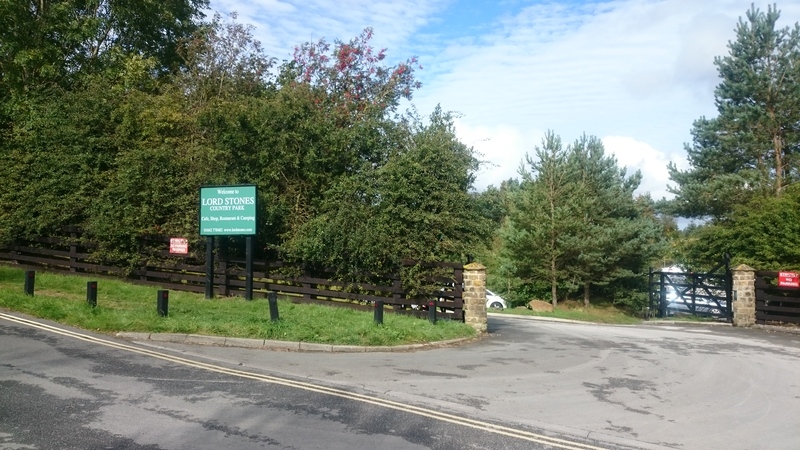 Plenty of good hills, not too far away from Peterborough (under 3 hours), quieter than many of the other National Parks and stunning scenery. So I put together a ‘big day out’ route, gathered a couple of mates and off we headed. To be honest, I’d hoped to drum up a bit more interest and head out with a group of around 6 riders but due to other commitments and a lot of wimping out several people couldn’t make it on this occasion. So there we were, the remaining 3 eager riders, in the village hall car park of Coxwold prepping our bikes for the off. My personal aims for this ride were two fold. I wanted to show off the NYM and provide an enjoyable but tough ride for my friends. I also wanted to bag the 2 additional NYM climbs from the 100 UK climbs book that were still outstanding. I had ridden up Rosedale Chimney and Carlton Bank already but I hadn’t had the pleasure of White Horse Bank and Boltby Bank yet. It’s a great route if you fancy a tough hilly day out. For anyone heading from the south like me, Coxwold provides a good starting point just outside the National Park and not too far from the A1. It doesn’t provide a great deal of time to warm up though, quickly presenting you with a view of the first climb and the white horse on the hillside from which this first climb gets its name. 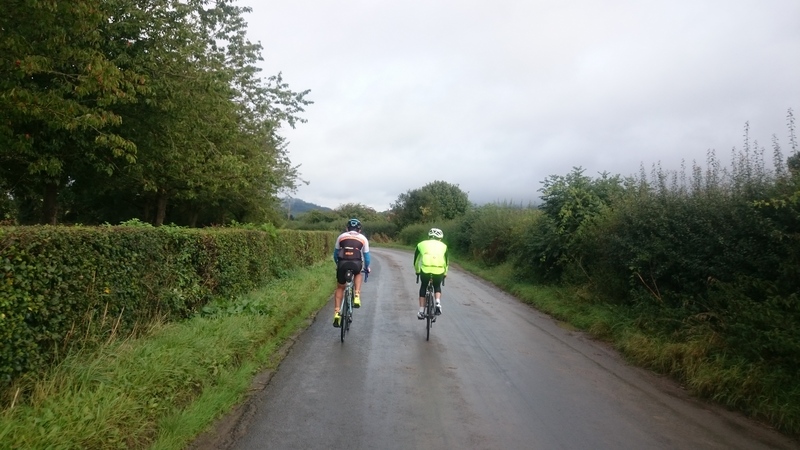 I had planned a KOM style contest for this event but with only three of us and half of the first climb under our rubber it became quite apparent the order in which we’d finish. Colin admitted he was not as strong as Joe and me and Joe didn’t have the legs to challenge me on this occasion and that became the order over the top on this and also the subsequent climbs. Leaving me with three 1sts, Joe with three 2nds and Colin with three 3rds; needless to say, I didn’t bother totting up the points! Having set off from Coxwold at 10 am, lunch came at about 1 in the afternoon courtesy of the café at Lord Stones County Park. An ideal place to stop if you’re ever up that way, lots of outdoor seating and a good selection of food. You can also stock up on energy supplies to take with you by means of the attached shop. I wouldn’t recommend their pork pies for ‘on the bike’ snacking though, as good as I’m sure they are. In between White Horse Bank and lunch though were two other obstacles. These go by the name of Boltby Bank and Carlton Bank. The latter you can afford to take at full effort because lunch is literally at the summit. That’s not to say that it’s an easy climb though. It’s an elevation gain of 199 m over 2 km; after all you don’t get into a ‘100 UK climbs’ book by being a short gentle rise. What it is, however, is one of my favourite UK climbs with some fantastic scenery especially looking to your left out from the moors to the low lands below. It’s also currently a fantastic surface to ride on having been re-laid with the smooth black stuff, none of those nasty rough chippings here. Carlton Bank is slightly less fierce than Boltby though. 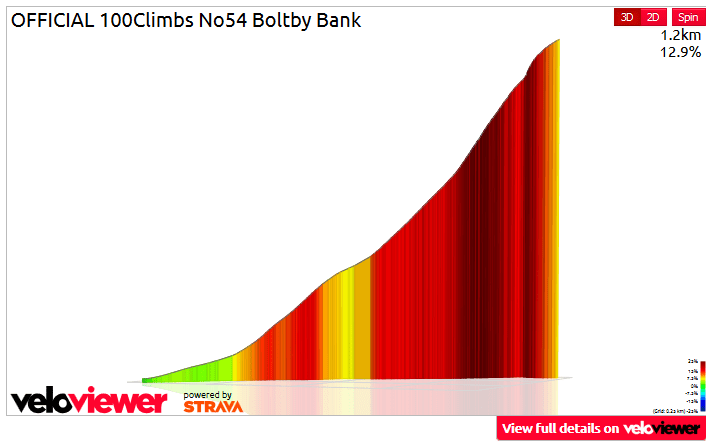 Hitting 25% and not providing any true respite anywhere up its 161 metres, Boltby Bank is a proper British climb. You won’t find much in the way of switchbacks or bends of any kind as the sadistic road builders chose the most direct route up, irrespective of the gradient. But fight our way up we did and my 8 mins 10 secs was quite a reasonable time leaving me 502nd out of 1686 on Strava. 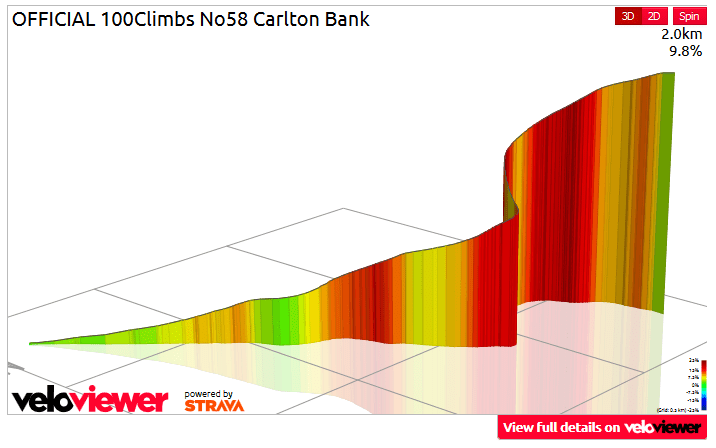 You just need to take a look at that gradient profile to get an idea of the relentless punishment in store for those that are brave or foolish enough to take it on. Following lunch we took an impromptu meeting to discuss ‘freshness of leg’ and whether to continue on the full route or whether to cut it short by taking the B1257 back to Helmsley and avoiding the ultra punishing Rosedale Chimney. I didn’t mind too much either way as I’d already ticked Rosedale off my list and the decision was made to cut the ride short. If you are planning on riding my route, this is the time to make such a decision as once you’ve cleared Chop Gate there are no further options for shortening the ride. I had never ridden down the B1257 previously so I didn’t know what to expect. Let’s just say if you can manage the full route, then I recommend you do. It’s not a bad road or anything but it is a bit busier and the scenery isn’t a patch on the other option. 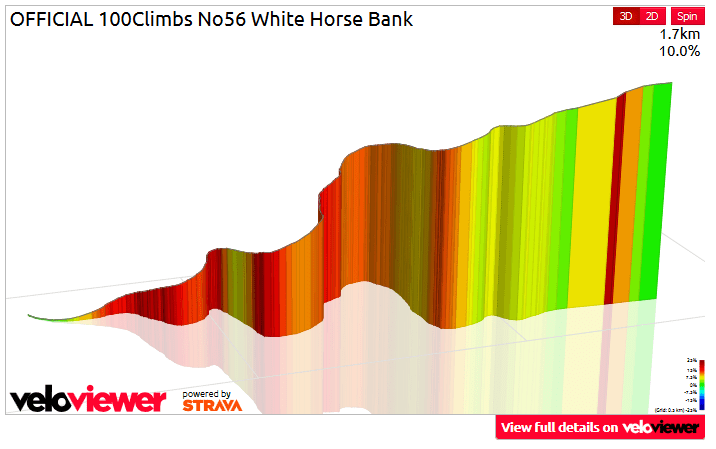 Also you miss the excellent long descent down into Hutton Le Hole and of course the mental climb of Rosedale Chimney. Although decending off the moors into Helmsley did give us the chance to pass 45 mph which is something you don’t often get the opportunity to do when you live around Peterborough. And so after a few more miles and a short detour to keep away from the main roads we ended up back at the car. Not without first passing Ampleforth College and Byland Abbey, both good photo opportunities should the mood take you. It’s not a route for the faint hearted but the North York Moors delivers scenic hills, or maybe that should be ‘banks’, in bucket loads. We took around 4 hours 30 to ride the shortened route not including the several stops to regroup and the hour for lunch. I think 6 hours of moving time is reasonable for a small group of relatively fit club cyclists to complete the full loop. If you want to give it a go, here’s a link to the route on Strava. If you do, please let me know how it went in the comments below.